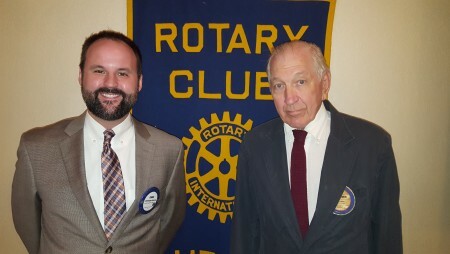 On Aug. 2, Auburn Rotarian Tom Vaughn (right) shared with fellow Rotarians about his and his family's personal friendship with Rotary International founder Paul Harris. Pictured with Vaughn is Club President Chris Warren. The club meets each Wednesday at noon at the Saugahatchee Country Club. For more information about the Auburn Rotary Club or how to become a member, visit www.auburnrotaryclub.com.